Connecting Country commenced the nest box program in the Mount Alexander shire and surrounds in mid-2010 and since then has installed over 450 boxes in private and public land. 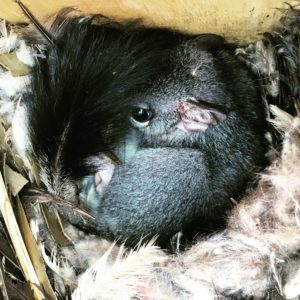 The nest boxes have been designed specifically for use by the threatened Brush-tailed Phascogale (also known as the Tuan), which is a nocturnal hollow-dependent marsupial that occurs in the local area. The nest boxes provide supplementary habitat for the Tuans and other native animals such as the Sugar Glider. It is anticipated that the provision of additional nesting sites, albeit artificial, will lead to an increase in local Tuan populations and distribution. The nest boxes are also located across the landscape systematically so that we can examine some of the factors that might influence whether they are being used by Tuans or other animals. Click here to download Connecting Country’s Nest Box Monitoring Strategy. In Autumn 2011, 255 boxes were inspected by Connecting Country at 85 locations and, in both Autumn 2012 and Autumn 2014, 300 boxes were inspected at 100 locations. We also received records from landholders and other persons who have seen Tuans either using the nest boxes, or have seen them elsewhere. A summary report was prepared after the 2014 surveys (click here). In 2016 we completed a full survey of all boxes – CLICK HERE to read our thrilling results! Click here for more information on making your own next boxes. Contact Jess if you are interested in monitoring nest boxes on your own property or elsewhere (info@connectingcountry.org.au or 03 5472 1594).